It’s very difficult for a bibliophile to pick a favorite book, but this one is close to the top. “Don” Vito Corleone is the head of a New York mob family who refuses to allow drugs into his territory. Because of his stand, he is the target of a hit, which he survives, thanks to the quick thinking of his youngest son, Michael. Michael is also the one to exact revenge although he never wanted to be in the family business. When his older brother is killed, Michael has no choice but to take over completely, showing his smarts in the violent, ensuing mob war. Michael settles all scores, which provides a very exciting and satisfying conclusion, eventually taking his place as the new “Don.” There is nothing I don’t like about this book. The plot is interesting and well-woven. The characters are fully realized. This book, rightly or wrongly, caused a love affair with the mob. “I’m going to make him an offer he can’t refuse . . . Keep your friends close and your enemies closer.” It doesn’t get much better than that! I’ve always wanted to read this book! The movies are so amazing. I’m definitely going to put this on my list! Read it. You won’t be sorry. 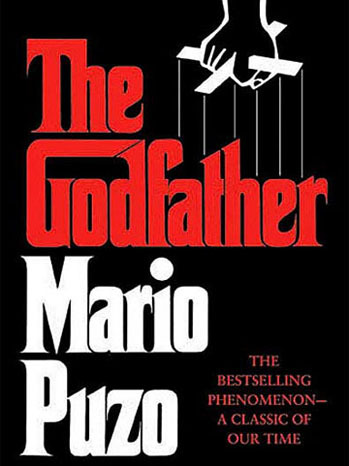 I put it off for awhile because I didn’t know how much I would be into a “mafia” story, but I honestly couldn’t put it down, the writing and story are that good. I loved the first movie, and frequently rewatch it, but I wasn’t quite as crazy about the ones that came after.